A motor vehicle accident Sunday on the LBJ Freeway has left one dead and five more injured, including a two-year-old child and two infants. The pickup truck of Juliana Reynosa, 30, was cut off by another motorist, resulting in the pickup truck spinning out of control, rolling over and eventually crashing. The driver of the other vehicle, Taneka Keichon Birdwell, 40, was arrested after failing a sobriety test. Witnesses told police that Birdwell’s vehicle cut off the pickup truck, triggering the accident. Reynosa was airlifted to a local hospital for treatment of her injuries and later died in the same facility. Birdwell was uninjured. 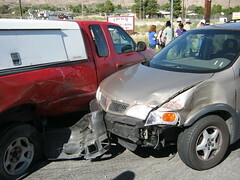 If you have been the victim of an automobile accident our attorneys are experts in personal injury claims. Our attorneys are here to listen to you and answer your questions no matter what the situation.